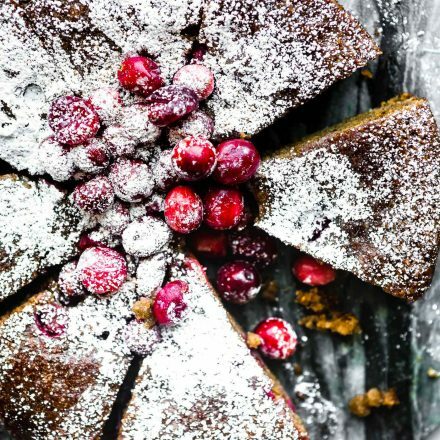 Grain Free White Chocolate Spiced Almond Cake! 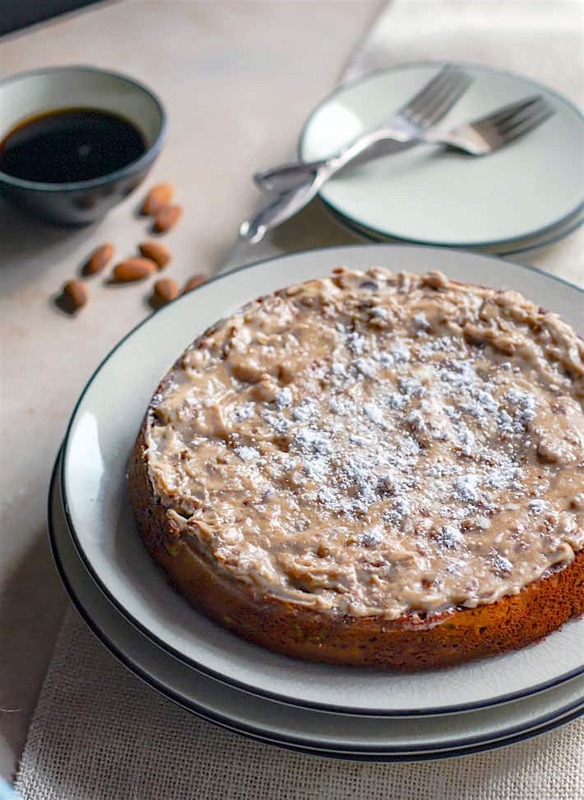 A healthier holiday twist on the classic almond cake! 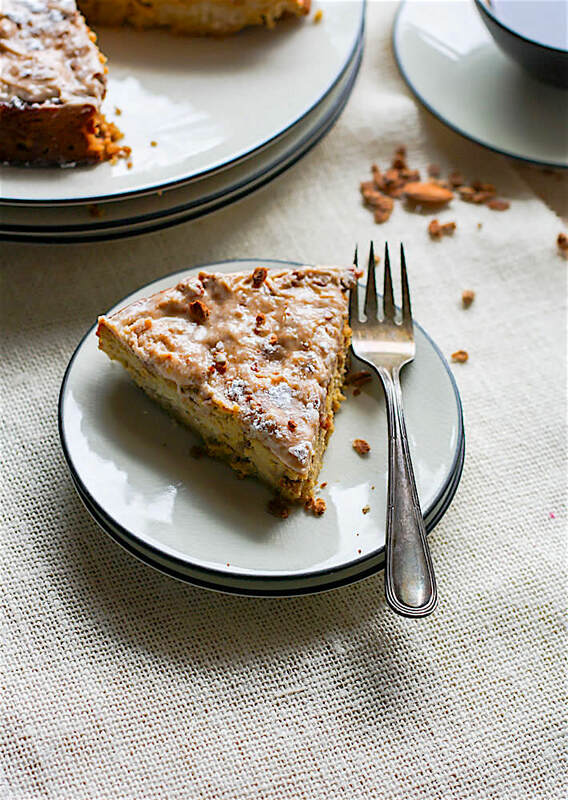 Cinnamon Spiced almond cake with melted white chocolate and a cinnamon cream cheese topping.Taste so decadent but is actually pretty healthy and easy to make. A perfect moist cake recipe for those looking to enjoy gluten free desserts. Really! Go ahead, enjoy! Hey hey! It’s day two of Friendsgiving! If you missed the first post with Taylor and my side dishes (plus the Better Body Foods giveaway) click here! Mmm K. Let’s get to the real focus here. Dessert! Cake! White Chocolate! Um, now all together please. White Chocolate Spiced Almond Cake! And you guessed it, grain free! Now, I will admit, my specialty when it comes to gluten free or grain free sweets are usually in the form on no bake ball (aka Healthy Bites). Learning to bake and make gluten free, let alone grain free, desserts and cakes have taken some time. It’s truly a trial and error process. More error than I’d like to admit, but hey, that’s why I do what I do. 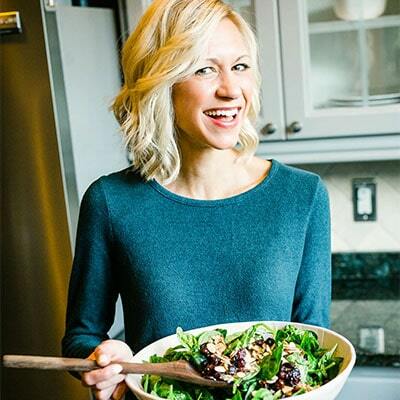 I like creating, tweaking, and making sure I can deliver healthy (or healthier) gluten free recipes that don’t taste like cardboard. Because, let’s face it, um, many gluten free and grain free recipes can turn out that way, am I right? And being that it is Friendsgiving week and only 8 days to go till the real Thanksgiving, I figured I better up my game. Hence the white chocolate and almond cake combo. Holidays are supposed to be enjoyed, including food. So why not make the food you can eat extra special. Or dare I say it? …. … A little indulgent. Okay, stop rolling your eyes at me because can I let you in on a little secret? I have a trick. More of a nutrition trick than anything. When it comes to making grain free or gluten free desserts taste indulgent, you really just need to stick with REAL FOOD. I mean, try not to go all fake sugar/low fats/etc. Ya, those kind of things. Yes they can cut calories but in the end, REAL FOOD ingredients can turn out to be pretty satiating and semi – healthy. A small slice can deliver big taste! Didn’t see that coming now did you? 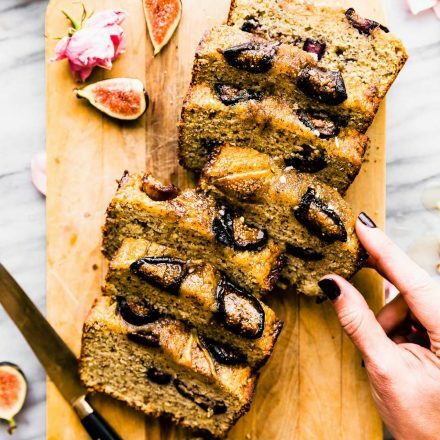 Real food ingredients that are full of flavor and healthy fats can definitely “take the cake” when it comes to gluten free desserts. Haha, pun intended. So after 3 rounds of recipes testing. I found the perfect almond cake to share today. Almond cake as in.. that soft moist middle that looks like flour is really just ground almonds! Well that and a few other key ingredients that help enhance it. 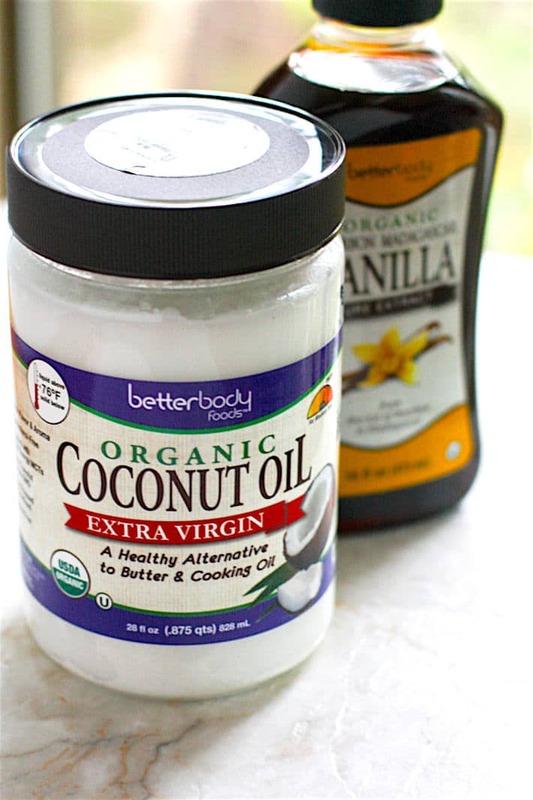 Like Better Body Foods Extra Virgin Coconut oil, Organic Madagascar Vanilla, and Organic Coconut flour. Side note –-> if you’ve never tried madagascar vanilla, you must. LIKE NOW! It’s amazing! But if you are looking for a dairy free frosting, have no fear.. 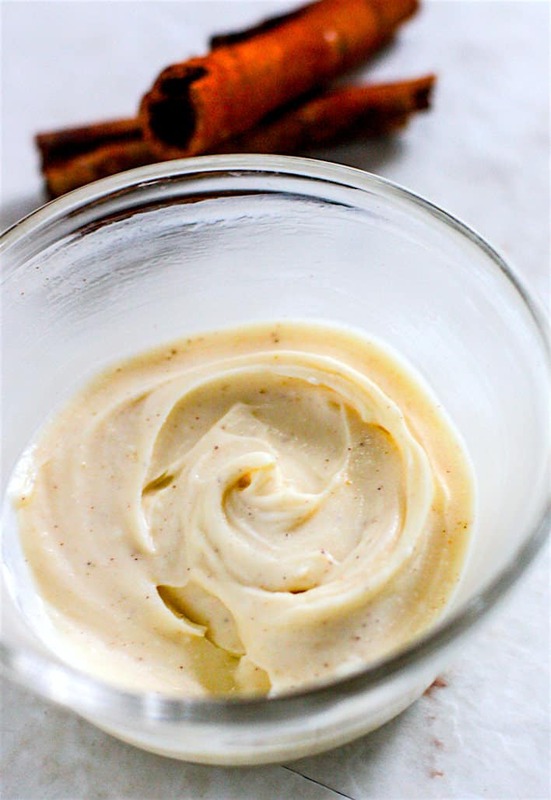 I got you covered –> cashew cream cheese frosting. And it’s VEGAN! Let’s not forget the topping on the topping. I grounded up a bit of maple grain free granola then sprinkled it on top of the frosting with a little powdered sugar. It’s all about the texture, ya know? 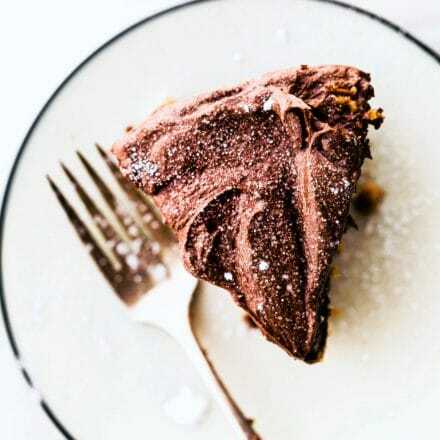 So you see, simple ingredients can really take a plain dessert and turn into a super moist decadent dessert/cake. And no one would ever know it’s grain free or semi-healthy! GASP! 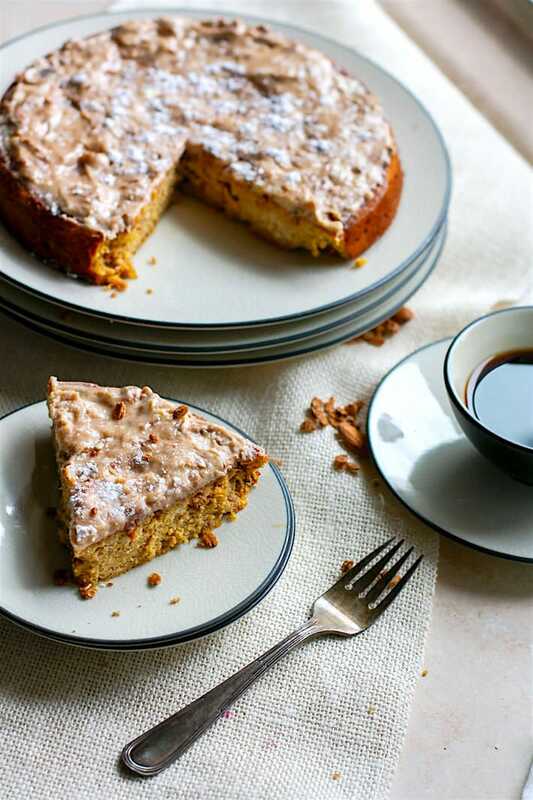 A healthy holiday twist on the classic almond cake! Cinnamon Spiced almond cake with melted white chocolate and a cinnamon cream cheese topping. First combine all your dry ingredients for the cake in a bowl. Sift coconut flour if it’s too thick. You want it fine and smooth. Next blend your pumpkin, eggs, and milk in blender. Set aside. If you haven’t already melted your white chocolate, do that as well. Make sure it comes out to 1/3 cup after melted. Fold in your pumpkin egg batter with the almond meal (dry ingredients bowls). Then add in your separate 1/2 c melted white chocolate and melted or softened butter. Add in your nuts and extracts, baking soda, plus cinnamon, salt. Mix or beat with electric blender until smooth. Pour into a 9 in round baking dish and bake for 45 minutes or until center is done. While cake is cooling, make icing. Softened the cream cheese and white chocolate. Mix together in a small bowl and then add in your extracts, cinnamon, coconut oil, honey. Top with optional nuts and sprinkle powdered sugar on top. I used better body foods coconut flour, coconut oil, and vanilla. To make dairy free, feel free to use chocolate instead with enjoy life dairy free chocolate. Then use vegan cream cheese. And speaking of real food and real ingredients. Let’s switch nuts for a second and talk about Taylor’s Paleo Pecan Bars. Yup, they are paleo. They are dessert. They look UNREAL GOOD! And knowing Taylor (and her recipes), they are going to taste OUT OF THIS WORLD GOOD. So head over there now and get the recipe! Mmm k? Now if only, we could make this virtual Friendsgiving become an IN REAL LIFE FRIENDSGIVING! One thing is for sure, ALL of you would be invited! And we’d probably eat like KINGS if everyone brought their favorite dish or dessert. 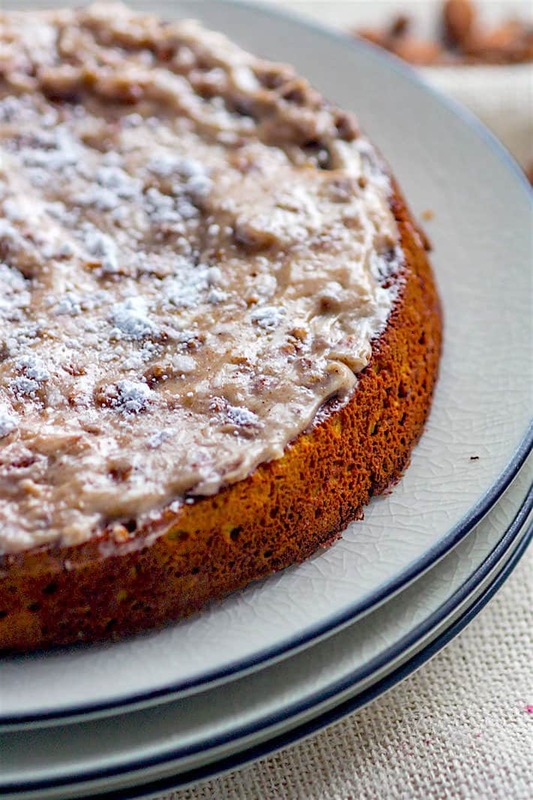 Have you ever made a classic almond cake? What dessert would you bring to Friendsgiving? Stay tuned for Friday. I will invite you end the meal with a Hot Toddy (for health reason of course). This post is sponsored by my Better Body Foods Friends! Thankful they supply us with such healthy gluten free and organic products. Yes, yes, yes! 🙂 That cinnamon cream cheese topping is calling my name…and the rest of the cake sounds pretty darn good, too. Love this combination of flavors! I love anything with white chocolate. I know you made this for me! I have not attempted making a cake but this may need to happen next week! I would bring my cranberry cupcakes, but the only problem is that no one really would be able to eat them. I’m working on new things 😀 Oh, I could bring my chai apple cider scones! Cinnamon cream cheese topping… UM HELLO! I must have you beautiful dessert, now! This is perfect to go along with a nice warm cup of coffee. I can see myself doing it now 🙂 Lovely photos girl! now bring your bars over and let’s party! Oh my gaaaah that frosting! Cream cheese frostings have always been my fave cake topping, and I’m obsessed with this almond flour//coconut four cake recipe you’ve got going on. This would be an amazing addition to any Friendsgiving, fo sho! I LOVE this cake!!! and love the almond + coconut combo!!! Beautiful! I’m drooling at the sound of ALMOND CAKE aaaaand cream cheese frosting. Do you think this would be an acceptable breakfast? <<real question. Oh goodness–I could eat this entire thing by myself, I’m quite sure! It sounds amazing! Cinnamon Cream Cheese topping. Yum, yum yum! I’m drooling over my breakfast haha! I want this cake!!! 🙂 Def. putting it on the holiday list to make! <3 just thought I'd let you know how much I appreciate you & the blog. This looks AMAZING!! Seriously just want to take a bite of it! For Friendsgiving one year I went to a bar. It was called bargiving. They poured drinks and the patrons all brought a dish. I brought pumpkin rum bread pudding. Your recipes are always soooooo freaking delicious looking!!! I want to eat this entire cake! now. please…. The fact that this has frosting makes me drool! You don’t know how obsessed i am with white chocolate, i’ve been putting it in my oatmeal every morning! Your’s and Taylor’s desserts look to die for! Ohhhh my goodness that frosting! The whole cake looks phenomenal. I agree so much that real foods are best for any type of baking – a lesson I learned the hard way when I used too much splenda in baking in college (ick). I’m looking forward to the Hot Toddy! OMG – lady – you have outdone yourself! For one – this cake – this cake I’d eat without cutlery all by itself – but when you iced it with that decadent white chocolate cinnamon cream cheese frosting and then you topped it with that powdered sugar and granola topping – well – now I want to eat this cake all by MYSELF! NO Sharing! I’m all about anything with frosting! 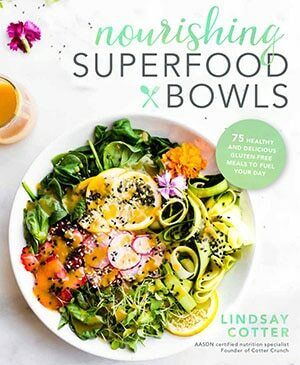 I need to figure out how to make sunflower seed flour – I’m guessing it’s not too tough. Dave having a nut allergy really limits me in my fun paleo style baking!! have you tried the pumpkin seed flour by nuts.com? It’s amazing!!! ot tigernut flour? Yum!This looks amazing! I’ve never made almond cake but I think I’m going to have to whip this up soon! Looks amazing, and yes, I would have to control myself with the icing. Let’s face it, cake is simply a vehicle to get the icing in your mouth without being a weirdo. So much respect for ya, for nailing this after three tries!! I’d like to take a spoon (or just my face) to the frosting. And cake. This looks soooo good! I am a terrible baker. 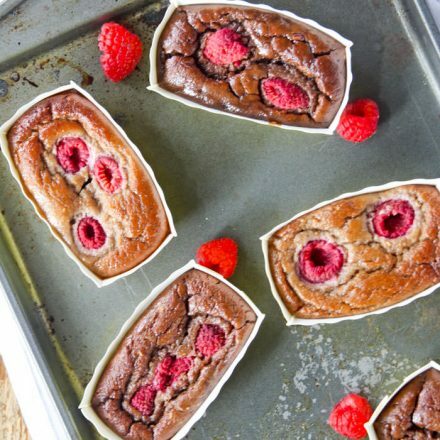 I always prefer grain free baked goods for some reason! This cake looks crazy good! I can hardly believe it is grain free!! LOVING the white chocolate and almonds in here! And that cinnamon cream cheese frosting?! GAHH! Give me that! SO YUM! Cheers! A recipe I am going to try and figure out how to make in the near future = white chocolate! This looks magical. I think I may even overlook the “white” part of chocolate just so I can try it out! 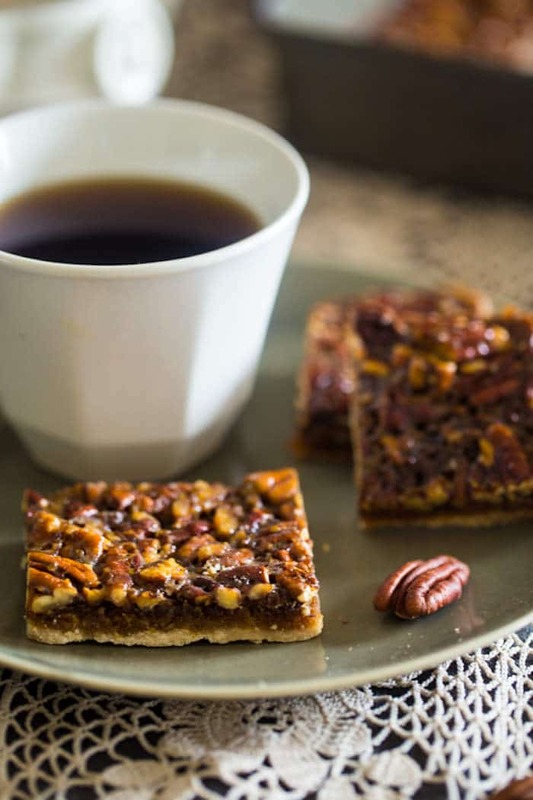 Killing me with this recipe O_O And those paleo pecan bars are looking rulllll good right now. You know I’m all about real food ingredients! Amen, give it up for whole foods, and this cake because it looks ah-mazing. I love the texture on top too. You know I saw this recipe many times, and I wonder why I didn’t check it yet! Pinned! yea! so glad. Let me know if you try it Farida! I’m a little confused what makes this cake healthy…? It still has eggs, butter, oil and added sugar. The added sugar is natural sugar from coconut palm and maple. The cake is not so much “healthy” as it is “healthier” without grains and no processed ingredients. I should have specified that. Sorry. How are maple and coconut palm sugar unprocessed?